The African Union (AU) has called for the suspension of the proclamation of the final results of the elections in the Democratic Republic of Congo (DRC). This follows consultations between the Chairperson of the African Union (AU) Paul Kagame, who is also President of Rwanda and leaders of the International Conference on the Great Lakes Region (ICGLR) and the Southern African Development Community (SADC). This is according to a statement issued to ZANIS in Lusaka today, by Zambia’s First Secretary for Press and Tourism in Addis Ababa, Ethiopia, Inutu Mwanza. Mrs Mwanza disclosed that a high-level consultative meeting of Heads of State and Government took place yesterday, January 17, at the AU headquarters in Addis Ababa. The meeting exchanged views on the situation in the DRC in the wake of the presidential, national and provincial legislative elections of December 30th, 2018 and agreed on a way forward. She stated that initiative is part of the African-led efforts, in the spirit of continental solidarity, to assist the DRC political stakeholders and its citizenry to successfully conclude the electoral process and preserve peace and stability in that country. Mrs Mwanza said the meeting was chaired by the Chairperson of the AU, and attended by 16 Heads of State and Government and representatives from SADC, the ICGLR and other African stakeholders. Chairperson of the African Union Commission, AUC, Moussa Faki Mahamat was also in attendance. Mrs Mwanza added that the meeting was briefed on the electoral process in the DRC and subsequent developments by the Deputy Prime Minister and Minister of Foreign Affairs of the DRC. She added that the meeting also followed updates from the Chairpersons of the ICGLR, SADC and the AU Commission, and had in-depth exchanges of views thereafter. Mrs Mwanza further said the Heads of State and Government attending the meeting concluded that there were serious doubts on the conformity of the provisional results, as proclaimed by the National Independent Electoral Commission, with the verdict of the ballot boxes. She pointed out that the Heads of State and Government agreed to dispatch shortly to the DRC a high-level delegation. The delegation will compromise the Chairperson of the African Union and other Heads of State and Government, and Chairperson of the AU Commission, to interact with all Congolese stakeholders, with the view to reaching a consensus on a way out of the post-electoral crisis in the country. Mrs Mwansa also said the meeting urged all concerned actors in the DRC to interact positively with the high-level African delegation in the interest of their country and its people. She further explained that the Heads of State and Government expressed their appreciation to the Chairperson of the Union for having taken the initiative of this consultative meeting. 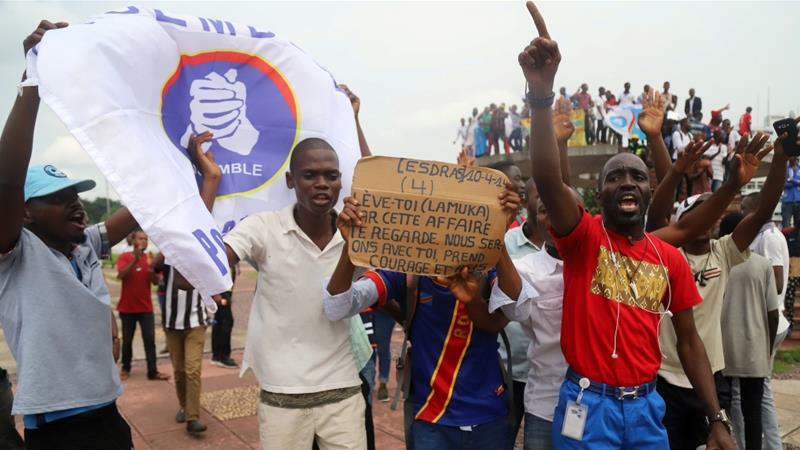 The Democratic Republic of Congo’s electoral commission declared opposition leader Felix Tshisekedi the winner of the December 30th, 2018 polls. However, Martin Fayulu, dismissed the results as electoral coup. President Edgar Lungu who was among the Heads of State that attended the consultative meeting in Addis Ababa, Ethiopia, arrived back home in the early hours of this morning around 01:00hours. He came back at 01:00 am? Ba Inonge at that age stayed awake to wait for him at 01:00am? Poor woman. Poor Lungu the SADC chair coming home with egg on his face. Wasting time meeting for something that could have been avoided. African Leaders should learn. It is like Zambia. ECZ and ConCourt mishandle elections. We end up having dialogue. Let us do things with integrity. Because of your deep rooted hatred for HH you even misinterpret Lusaka Times who have carried this story as Zambian Watchdog ishhh..
Is Africa Union the Zambian Watchdog now? You are an architect of rigging & malpractice. Repent from evil vices when the sun still dawns on you. I can assure you if The Sovereign God says HH will be a president no one shall stop him to realize his dream. After all he is a Zambian. I also don’t like HH because he’s put tribalism as a spring board to State House. Paul Kagame and Rwanda have vested interests in an unstable Congo. Research rare earth metals, then comment. This is sad for Zambia and the region, because Congo is a possible future market for Zambian goods. Both PF and the opposition should shut up about this one. who says DRC WILL NOT EXIST IWE CHIKOPO NZELU AFTER THIS IMPASSE, WE SHALL STILL TRADE DANCE AND EAT WITH CONGOLESE OUR GOOD NEIGHBOURS , THE ISSUE IS WHAT IS THE STAND F THE HEAD OF POLITICS , WAR, SECURITY IN SADC , HE SEEMS TO HAVE ISSUED TUMA STATEMENTS THAT WERE BRUSHED OFF HAHAHAHA..ILKO BAD U HEAD OF POLITICS IN SADC HMM..
Toothless AU and its SADC. I have no faith on these organisations.